The O1s region may be overlapped by peaks from antimony, palladium or vanadium. In the case of palladium, collect the full Pd3p / O1s region (525–580eV), making sure both Pd3p3/2 and Pd3p1/2 components are acquired. In the case of antimony, collect the full Sb3d / O1s region (525-550eV), making sure both Sb3d5/2 and Sb3d3/2 components are acquired. During sputter depth profiling, it is preferable to collect data from the O1s region first in each data collection cycle. Interpretation of O1s spectra is not straightforward. 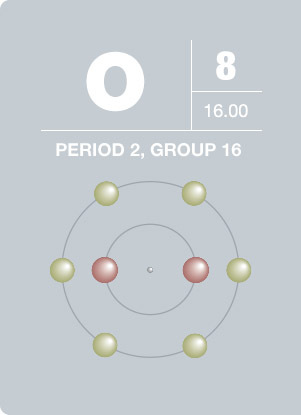 Apart from metal oxides, the O1s binding energy of many compounds and species falls within a very narrow range. 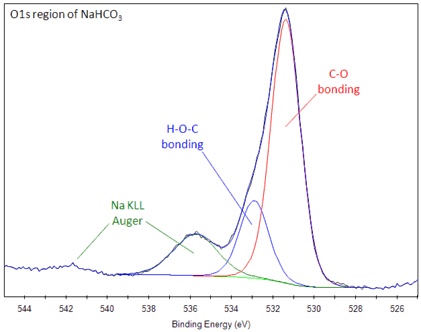 O1s peaks tend to be broad, with multiple overlapping components. Components due to water and/or organic contamination overlap directly with SiO2, for example. Organic contamination also makes it difficult to discern carbonates in the O1s region. It is typically not possible to uniquely peak fit these overlapping components. The user normally has to impose peak fitting constraints, e.g. all overlapping components have the same (or similar) full width half-maximum. The peak fitting challenges mentioned above make it difficult to accurately quantify the oxygen chemical states. 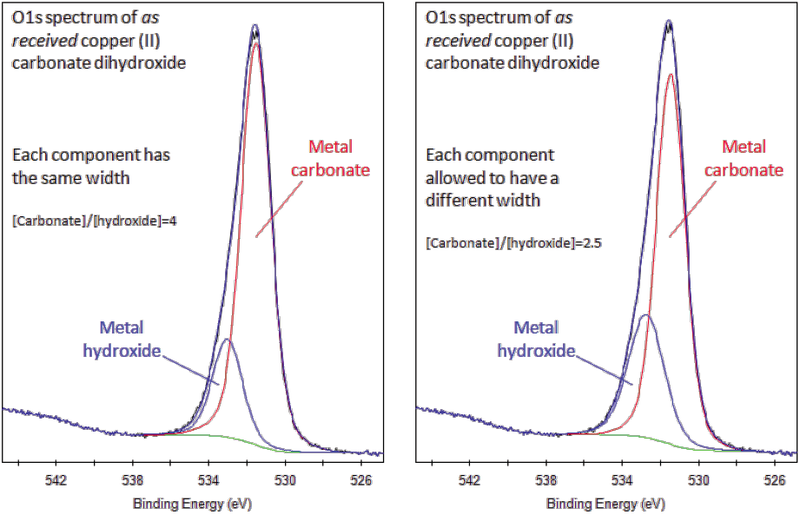 In the copper (II) carbonate dihydroxide example shown above, the quantification of the carbonate versus hydroxide changes significantly according to peak fitting procedure. 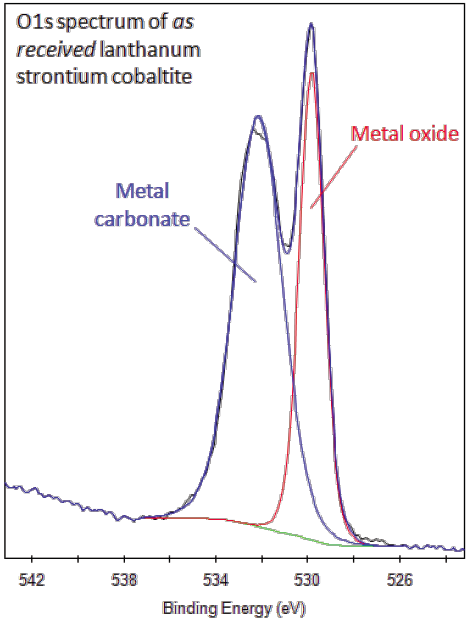 Metal oxides appear at a significantly different binding energy compared to most other oxygen species. Also tend to have narrower O1s peaks compared to other species, e.g. carbonates. It is often possible to directly observe the relative full width half-maximum of each component in the O1s spectrum. Sodium Auger peak (Na KLL) sometimes observed ~535eV. Peak is much broader than O1s XPS components. If a particularly large chemical shift is observed, it could be due to O-Fx bonding. 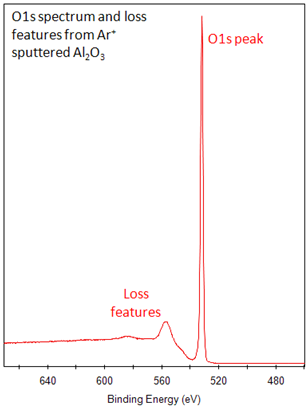 A big loss feature is often observed to higher binding energy of the main O1s peak. Oxygen will always be present on samples exposed to the atmosphere, either due to adventitious contamination, oxidation or water. Can use O1s peak position and plasmon to measure band gaps for certain materials. Oxygen, the “elixir of life,” was discovered by Joseph Priestly and Carl Wilhem Scheele independently of each other in the 1770’s. Oxygen is critical for life on Earth, produced by plants during photosynthesis and necessary for aerobic respiration in animals. Accounting for one fifth of the earth’s atmosphere, oxygen combines with most elements and is a component of thousands of organic compounds. Oxygen is colorless, odorless and tasteless in its gaseous form, and condenses to pale blue liquid and solid forms. Oxygen is a highly reactive element that promotes rapid combustion and is often used in industrial application.